It’s warming up here finally…yay! 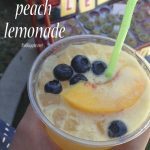 With Summer on its way, I thought it would be fun to share the big favorite from our gourmet lemonade stand from last Summer. 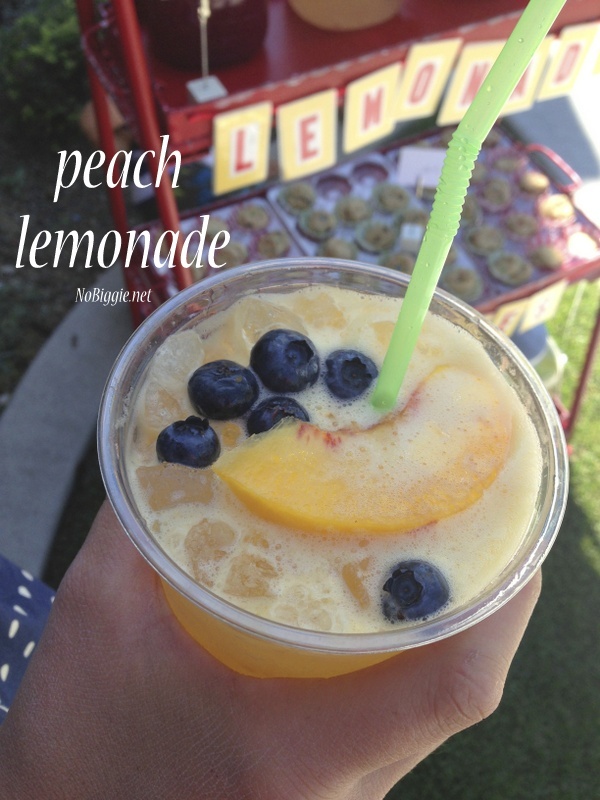 Everyone loved the peach lemonade the most! It probably helped that we were using the best fresh peaches from our local fruit stand. Peaches freeze so well, so you could easily make this recipe year round. Okay, for the recipe. You can go the all natural route and squeeze real lemons and do the simple syrup thing if that’s what you’re into…but, in keeping it real, I used Country Time lemonade mix for this, and it worked great. When peaches are in season, you HAVE to make this sparkling fresh peach lemonade, it's so refreshing and delicious! In a good blender, blend together the top three ingredients. Contents will settle over time, so serve quickly and stir before serving. Fill your cup half full of pebble ice (the best ice! ), and with a ladle, pour a few scoops of the peach lemonade over the ice. Add in a little Sprite or 7up if you like the fizz of the carbonation. Garnish with frozen blueberries and a frozen peach slice. Serve in a clear plastic cup so you can squish the ice around as you drink it. You can double this recipe too if you’d like. The other three lemonade recipes at our lemonade stand were good too, just not AS good. 😉 We had blueberry, watermelon and raspberry lemonade. All made really similar to how we made the peach lemonade. 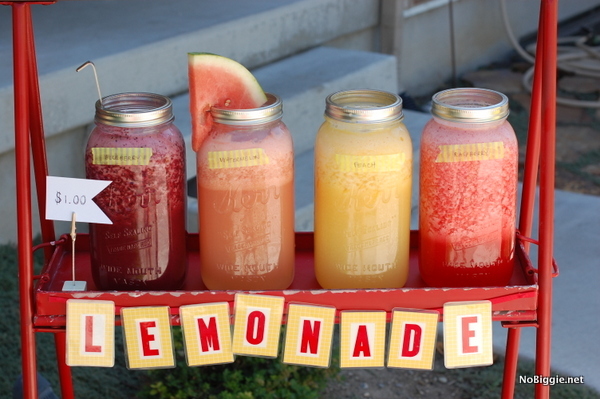 This little gourmet lemonade stand was so much fun, I can’t wait to do it again this Summer. Made this for a bridal shower today and it was big hit! I couldn’t find fresh peaches so I used canned peaches and it worked well. I’m excited to try fresh peaches this summer when we’re in Utah. Thanks for sharing! Oh good! Thanks for sharing! !